xCoAx is an exploration of the intersection of computational tools and media, with art and culture, in the form of a multi-disciplinary enquiry on aesthetics, computation, communication and the elusive X factor that connects them all. 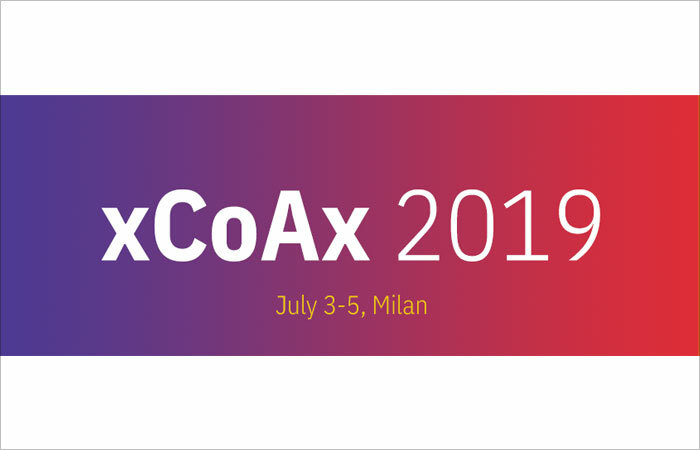 In 2019 xCoAx will take place in Milan, Italy. You are invited to submit theoretical, practical or experimental research work that includes but is not limited to the following topics: Computation, Communication, Aesthetics, X, Algorithms / Systems / Models, Artificial Aesthetics, Artificial Intelligence, Audiovisuals / Multimodality, Creativity, Design, Interaction, Games, Generative Art / Design, History, Mechatronics / Physical Computing, Music / Sound Art, Performance, Philosophy of Art / of Computation, Technology / Ethics / Epistemology. All accepted works will be published in a proceedings book with ISBN (see http://proceedings.xcoax.org for previous editions) and the authors of the best papers will be invited to a special issue of the Scopus-indexed Journal of Science and Technology of the Arts (http://artes.ucp.pt/citarj/).